This is a REALLY easy, simple recipe. It is a little too spicy for kids, so if you want to make it for them, I would hold off on the red pepper flakes, or maybe just add a dash. What I loved most about this recipe is that not only is it really quick but it made for an excellent salad the next day. For dinner we put it over brown rice and served it with a side of green beans and carrots. I love being able to use leftovers for lunch the next day, so I really felt like I was winning here. I’ll put what I did different than the original recipe in parenthesis because frankly I almost always switch something up. This is a 30 minute meal! Directions: Heat oil in a medium sized skillet over medium-high heat. Add garlic and ginger in pan and cook for one minute. Stir in mushrooms, scallions, red pepper flakes, ¼ tsp of salt and 1 tsp of pepper, cook for 3 minutes stirring frequently. Reduce heat to medium and add chicken to the pan, sprinkle with remaining salt and pepper. Cook, stirring often, for about 4 minutes or until your chicken is cooked through. Stir in soy sauce, vinegar, and cilantro, and cook for about 2 minutes. 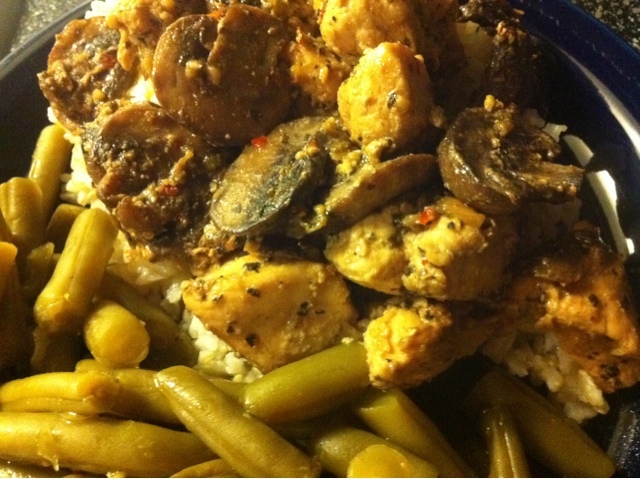 Leftover Spicy Chicken and Mushrooms from dinner the night before.